One of the downsides of being an Anglophone expat in Paris is that there isn't a lot of live entertainment in English. I'm not complaining. It's to be expected when you reside in a French speaking country. But since I can't afford to dash off to London whenever I get a craving for live theatre, I've learned to take advantage of whatever Paris has to offer. I went to see Streetcar Named Desire when it was performed at Le Comedie Française and Romeo and Juliet at Le Tour Vagabond. While I enjoyed both productions, I had to work harder than I wanted to understand the French translations. It wasn't possible to relax and let the words wash over me. That's why I was overjoyed when Sylvia and I received an email from author Cara Black with the exciting news that her good friend Joanna Bartholomew is producing and acting in The Tempest. 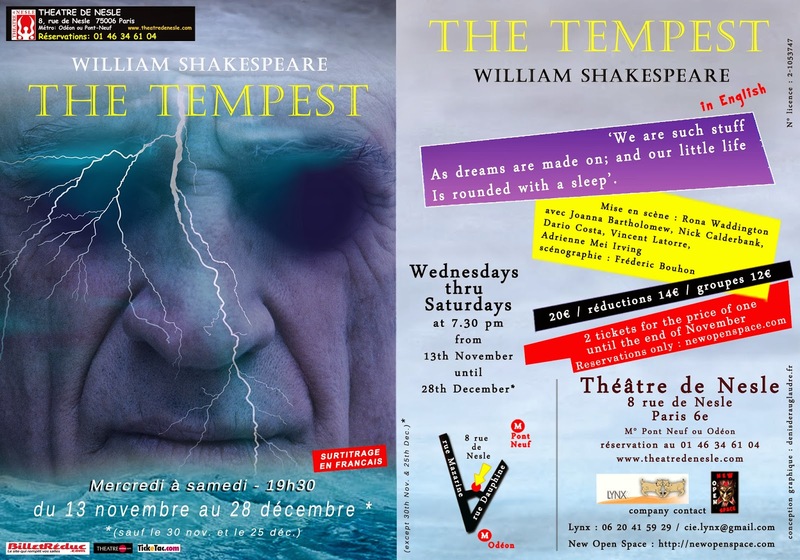 That's right -- The Tempest in English, not Le Tempête in French! After a flurry of emails back and forth, Sylvia and I made a date for the show's opening night at Théâtre de Nesle in the sixth arrondissement. As Sylvia and I settled into our front row seats, the sound of a rainstorm and a series of thunderclaps transformed the intimate theatre into a ship tossed violently upon the turbulent sea. With little on-stage scenery, the professional cast of five used dramatic sounds effects and Shakespeare's words to set the scene. Nick Calderbank's Prospero was by turns tender and merciless as he plotted to reclaim his stolen dukedom. At his side, Joanna Bartholomew's Ariel was sprightly and beguiling. Joanna is so agile that I found myself momentarily wondering if she does yoga. How else, I thought, could she remain perched with one foot upon a log for such a long time. With quick changes of costume and expression, Adrienne Mei Irving convincingly transformed herself from the naive Miranda into the aggressive yet cowardly Sebastian. All too soon, it seemed, this abridged version of Shakespeare's last great play came to an end. Reserve in advance and get two tickets for the price of one (20€) until the end of November. That's about the same price as a movie ticket and it supports live theatre in English in Paris. The Tempest, performed in English with French subtitles. Wednesday - Saturday at 7:30 pm until December 28, 2013. Glad to hear you enjoyed the performance. I've already commented on Sylvias blog that unfortunately Shakespeare leaves me cold...... but the stories are good. 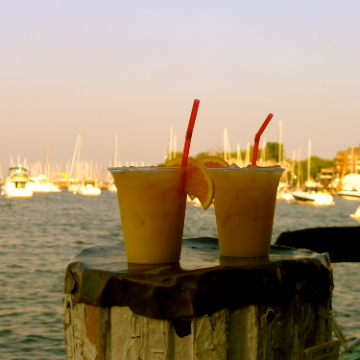 On one of our first "dates" Michael told me that his friend had bought two tickets to Comedy of Errors at the theatre, and his "friend" had dropped out so would I like to go with him? didn't like Shakespeare but fancied Michael anyway so went along. he was just trying to impress me, but I was bored to tears, (I confessed years later) NOT funny at all!. .... Still with him though, so vive la difference!......LOL!